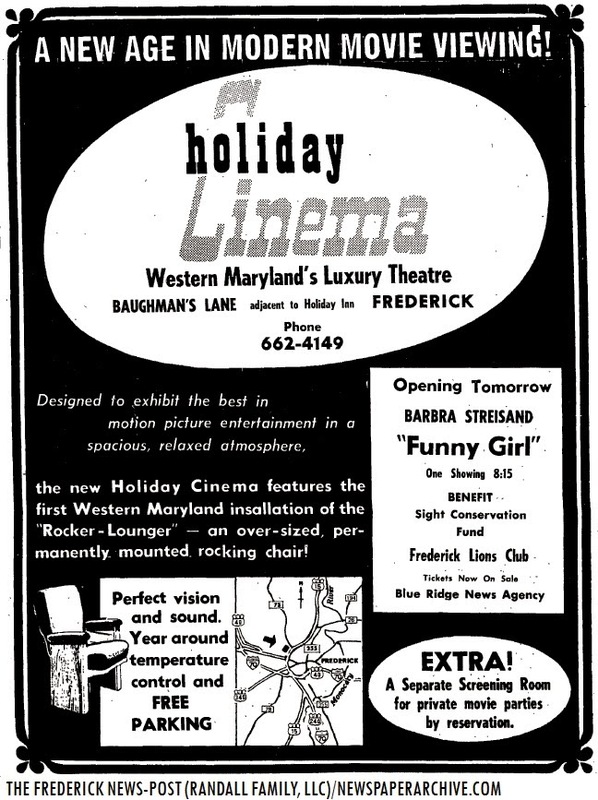 “A ‘new age’ in modern movie viewing!” 1969 grand opening advertisement for the now-defunct Holiday Cinema(s) from The Frederick News (News-Post); featuring a mention of the theater’s screening of “Funny Girl” (1968) and the “Rocker-Lounger” theatrical seating chair. Sidebar: This was written in connection to the recent closure of Frederick’s second-run Holiday Cinemas twinplex, according to the April 10 edition of the Frederick News-Post. Long before the Loudin organization (MDL Entertainment) managed and owned the Holiday, the theater originally opened as a first-run theater complex on Oct. 23, 1969, according to CinemaTreasures. A more detailed post on the history of Frederick’s Holiday cineplex (written for the 45th anniversary of the theater in 2014) can be found on my previous cinema-oriented blog, “At the Matinee.” -C.H. Looking back at a vintage pre-grand opening advertisement from the Oct. 22, 1969* edition of The News (News-Post) for the pre-twinplex Holiday Cinema (in Frederick, Maryland) with their opening night (Oct. 23, 1969) screening of the 1968 William Wyler–Ray Stark–Columbia musical biopic of Fanny Brice with Barbra Streisand and Omar Sharif, “Funny Girl;” there was also a new innovation that was mentioned in the advertisement. 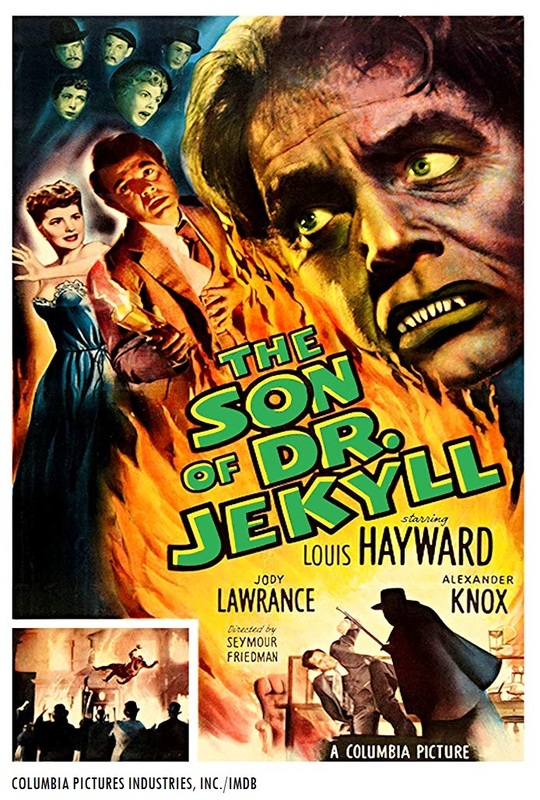 Fellow Svengoolie SvenPals everywhere will be interested in a classic Columbia Pictures cult thriller from the master of macabre cinema featuring a Hollywood legend. 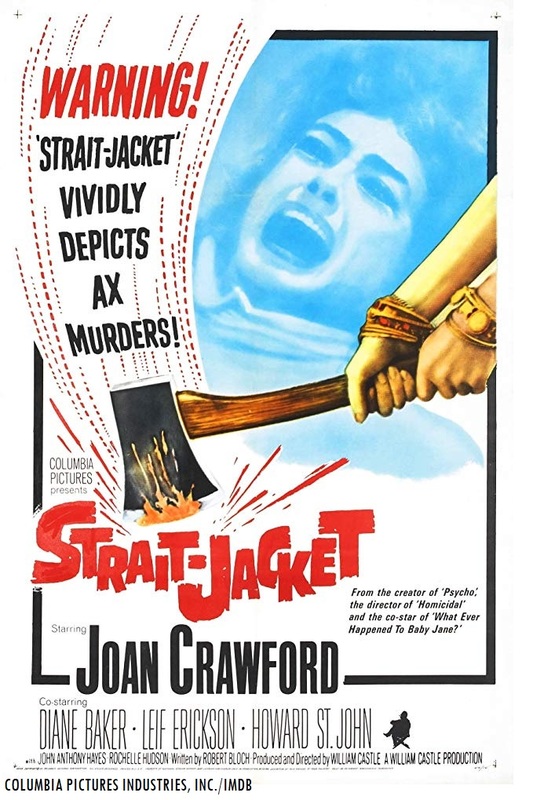 Original 1964 Columbia Pictures poster art for William Castle‘s “Strait-Jacket,” featuring Joan Crawford. The legendary Chicago/Berwyn-based thriller film host will present his big coast-to-coast broadcast premiere of “Strait-Jacket” (1964), this Sat., Feb. 23 at 8 p.m. Eastern/7 p.m. Central on Me-TV. “Strait-Jacket” (1964) was directed by legendary veteran cinema thriller-horror director William Castle, known for “Macabre” (1958), “House on Haunted Hill” (1959, with Vincent Price), “The Tingler” (1959, with Price), “13 Ghosts” (1960, with Charles Herbert), “Homicidal” (1961, with Glenn Corbett), “The Night Walker” (1964, with Barbara Stanwyck and Robert Taylor) and “I Saw What You Did” (1965). 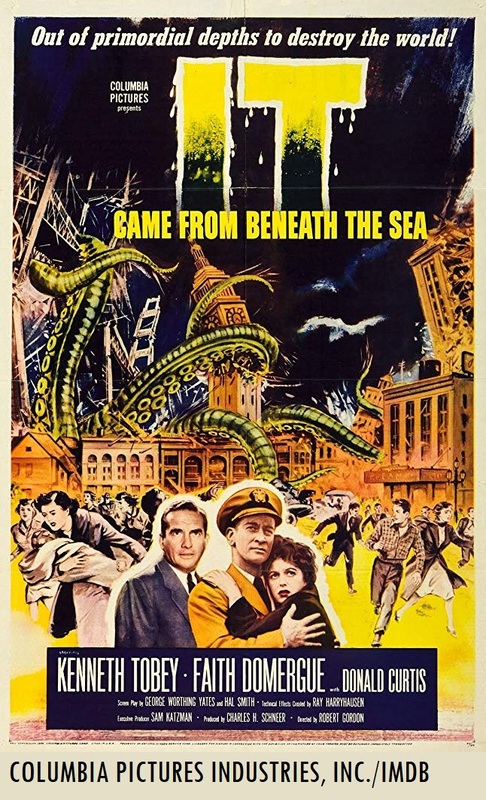 The screenplay for Castle’s 1964 Columbia thriller was written by Robert Bloch. Bloch was famous for his thriller novel “Psycho,” which was adapted into a successful thriller film of the same name by Alfred Hitchcock in 1960 (with Janet Leigh and Anthony Perkins). According to IMDB, Svengoolie previously showcased William Castle’s “Strait-Jacket” (1964) on his hometown television station in Chicago/Berwyn; WCIU-TV 26/”The U” back in Nov. 2009.
Who was in William Castle’s “Strait-Jacket” (1964)? The players who appeared in William Castle’s 1964 Columbia thriller were Joan Crawford (as Lucy Harbin), Diane Baker (as Carol Cutler), Leif Erickson (as Bill Cutler), George Kennedy (as Leo Krause), Lee Majors (as Frank Harbin, Majors did not receive screen credit for Castle’s 1964 production); Howard Hoffman (in an uncredited role), Rochelle Hudson (as Emily Cutler), Edith Atwater (as Mrs. Anderson Fields), Mitchell Cox (as Dr. Anderson), Howard St. John (as Raymond Fields), John Anthony Hayes (as Michael Fields), Vicki Cos (in an uncredited role as young Carol Harbin), Laura Hess and Patty Lee (in uncredited roles as young children); Patricia Crest (in an uncredited role as Stella Fulton), Lynn Lundgren (in an uncredited role as a beautician) and Robert Ward (in an uncredited role as a shoe clerk). That same year, Joan Crawford and Diane Baker appeared in Robert Gist’s film drama, “Della” (1964). One year later, Crawford played the role of Amy Nelson in another William Castle thriller; “I Saw What You Did” (for Universal Studios in 1965; with Erickson, Sara Lane, John Ireland, Andi Garrett, Patricia Breslin and Los Angeles TV personality Tom Hatten). Some of George Kennedy’s best-known appearances throughout his screen career were in “The Dirty Dozen” (1967), “Cool Hand Luke” (1967, with Paul Newman) and Universal’s “Airport” franchise series of action thrillers in 1970, 1975, 1977 and 1979 (in the role of Joe Patroni). “Strait-Jacket” (1964) marked one of Lee Majors’ earliest screen appearances. He was recommended for the role of Frank Harbin by actor Rock Hudson, according to IMDB. Majors went onto greater fame for his role of Col. Steve Austin in Harve Bennett ‘s action-adventure TV series, “The Six Million Dollar Man” (orig. 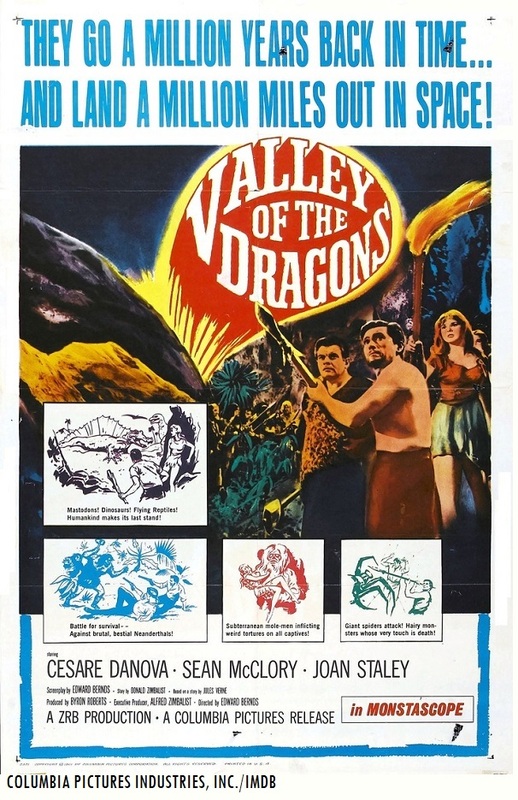 produced as a made-for-TV movie in 1973, the series lasted from 1974-78). Fellow Svengoolie SvenPals everywhere will be jumping for joy for his upcoming big coast-to-coast broadcast premiere of a classic Columbia Pictures sci-fi fantasy creature feature. The legendary Berwyn/Chicago-based sci-fi film host will present his big Groundhog Day broadcast premiere of “The Giant Claw” (1957) from coast-to-coast this Sat., Feb. 2 at 8 p.m. Eastern/7 p.m. Central on Me-TV. 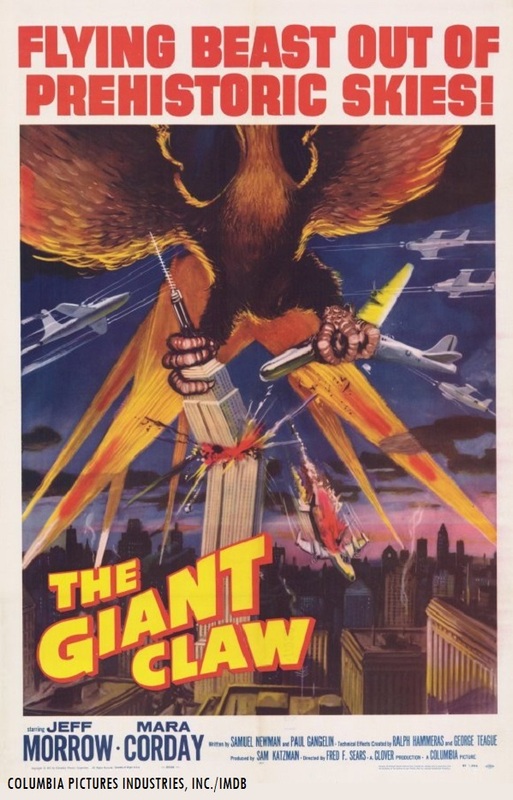 “The Giant Claw” (1957) was directed by veteran Columbia contract actor-turned-director Fred F. Sears and was produced by longtime studio producer Sam Katzman. Sears and Katzman’s successful Columbia features include “The Werewolf” (1956, with Steven Ritch, Joyce Holden and Don Megowan), “Rock Around the Clock” (1956, w/ The Platters, disc jockey Alan Freed and Bill Haley’s Comets; ), “Earth vs. the Flying Saucers” (1956, w/ Hugh Marlowe and Joan Taylor; featuring Ray Harryhausen’s Dynamation stop-motion sequences); “Don’t Knock the Rock” (1956, w/ Little Richard, Alan Freed and Bill Haley’s Comets) and “The Night the World Exploded” (1957, w/ Kathryn Grant and William Leslie). 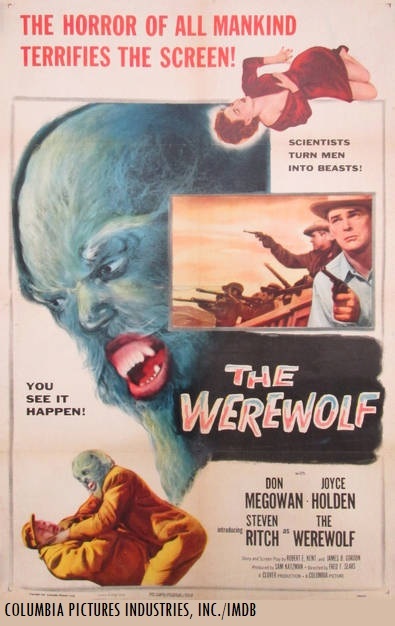 Who was in “The Giant Claw” (1957)? The players who appeared in Sears and Katzman’s 1957 Columbia sci-fi creature entry were Jeff Morrow (as Mitch MacAfee), Mara Corday (as Sally Caldwell), Morris Ankrum (as Lt. Gen. Edward Considine), Louis Merrill (as Pierre Broussard), Edgar Barrier (as Dr. Karol Noymann), Robert Shayne (as Gen. Van Buskirk), Frank Griffin (as Pete, Griffin was credited under the pseudonym of Ruell Shayne*) Clark Howat (as Maj. Bergen), Morgan Jones (as a lieutenant) George Cisar (in an uncredited role as an airplane passenger), Robert B. Williams (in an uncredited role as a state trooper) and an uncredited cameo vocal appearance by Fred F. Sears (as the narrator).